It was Saturday, May 25th and I had a wedding to be at but that didn’t stop me from scoring a great piece from a local garage sale! Best way to shop garage sales! Isn’t technology wonderful?! This text came through from a friend who was out hitting the sales. 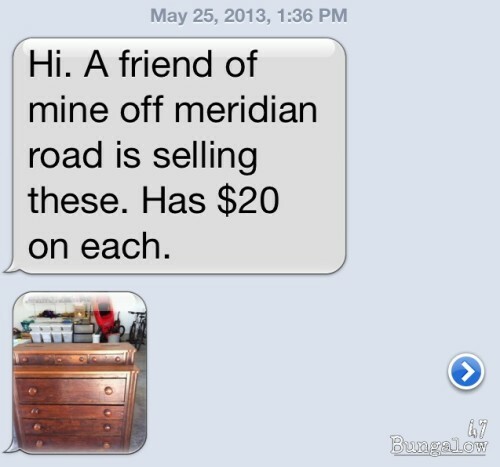 Can you believe she came across this great dresser for only $20? Buying it was a total no brainer!! She did all the hunting and all I had to do was pick it up (and pay for it) the next day. SCORE! 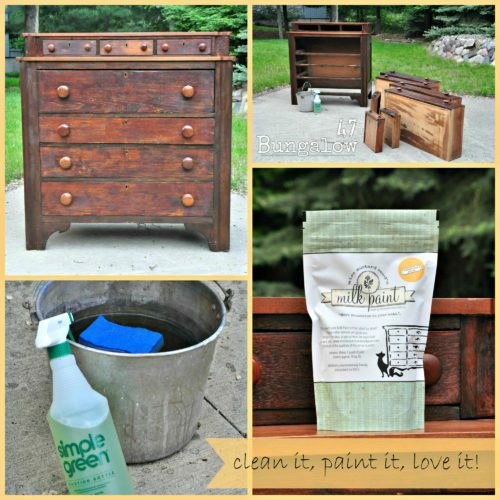 The moment I saw it I knew it was perfect for Miss Mustard Seed’s Milk Paint. I selected Mustard Seed Yellow, cleaned it with some Simple Green and GoT BuSY!!. 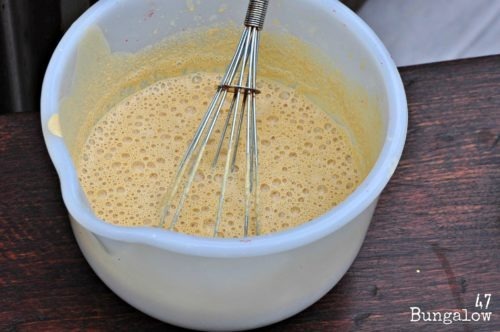 I’ve used blenders to mix MMSMP but I actually prefer to mix it with a whisk. I use warm water, give it a quick whip and let it sit for a bit to let any big chunks dissolve. I actually don’t mind chunks though, they end up creating some great looks. On this piece I wanted to create some color variation in the yellow so the chunks were going to work in my favor. 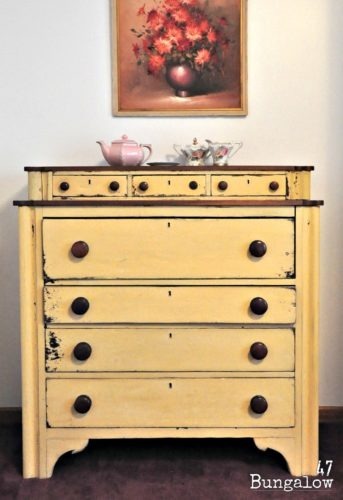 I even had plans to add more chunks by dipping my wet brush into some dry Mustard Seed Yellow Milk Paint and then streaking that onto the dresser. Did I mention I like the chunks? First, I put a thin coat of paint on the entire piece. Then, I put a small amount of the dry MMSMP Mustard Seed Yellow on a plate. Next, I took the brush with the dry paint stuck to the tip and lightly brushed that on top of my first coat of paint. 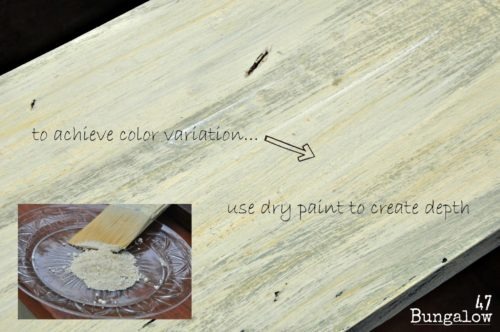 This also works well with using a different color of paint. Obviously the dry paint is going to leave some bumps on your piece, but those buff out nicely with a fine grit sanding sponge after the paint is dry. Here you can see the streaks of darker and lighter yellow on the piece. That’s from brushing the dry MMSMP powder onto it. It’s subtle but it’s there. New favorite. I’m in love! Most of the pieces I do end up in the store but this one captured my heart so it found it’s way into my home. It’s a new favorite in one of our guest rooms. I didn’t add any bonding agent so it did peel slightly but not very much. I attribute that to cleaning it. I find that the better a piece is cleaned the less it peels. Of course now that I say that, the next piece I do will probably all peel off. 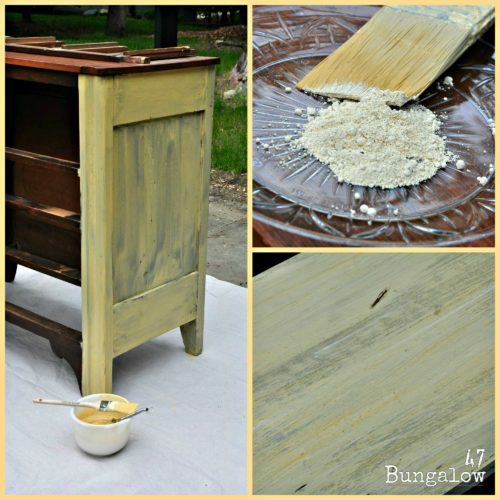 Milk Paint is totally unpredictable that way, but that’s what makes it FUN! I also applied three thin coats of paint on this piece, I think that helps keep the peeling to a minimum too. You can see in these shots that it only peeled in a few spots, and the color variation is there but it’s very subtle. What do you think? Have you tried Milk Paint yet? It came out great and I love that yellow!!! 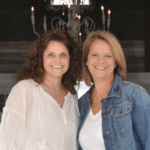 Stopping by from the retailers page! What a score!! It came out wonderfully! The tips you gave were spot on too! “$20 on each of these”. Was there a second one? Paint the same? What’d I miss? Oh my gosh….that’s a super tip! 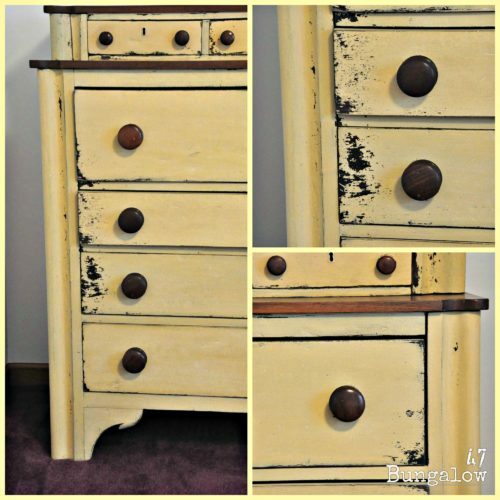 When I first started using milk paint it frustrated me when I would find a lump and leave a different color streak…..now I know how to fix it and also know how to intentionally make streaks….YEA! Love this piece….very striking!! Thank you. I used to think things needed to look perfect then after examining legit chippy peely pieces I found the more variation the better. Beautiful! I have several pieces I need to redo as I put them in my new house and this yellow would really pop against the colonial blue of the walls! Love the dresser! did you sand the whole piece down after the three coats? Also, did you use MMS wax? I didn’t sand very much and yes, I did use the MMS wax.